Came to the Newcastle match heard no singing except of course from Newcastle fans bit crap really. Where’s that atmosphere gone? Absolutely this plus the fact the refs won’t give contentious decisions to the big boys in the future so much for fear of looking stupid when VAR overturns. Ok so the Birmingham mail are saying the main reason the manager got the tin tack was the fact they lost the quality Harvey bought to the team and the inability to replace him. I think we have a gem of a footballer on our hands moving forward. My honest perception was we continued from the season before with maximum confidence. The first match of the season against Sunderland if you recall was before the change of full backs and was without the newly signed Kante. I was in the posh seats next to two Sunderland scouts who said to me either you have suddenly turned into Barcelona or we are total garbage. Has it happened there was a bit of truth in both. Ranieri tweaked but didn’t tinker and kept the fire stoked up. With Kante that season it was almost cheating and like playing with 12 men. 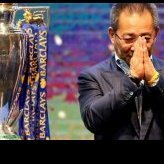 Another factor was because the big teams and most of the others thought it was little old Leicester we won’t change how we play and kept a suicidal high line and that lesson that season was never learnt.